Warner Bros. Studios quirky, off-beat superhero film “Shazam!” took home the box office crown for the second consecutive weekend, easily surging past some lackluster new films. 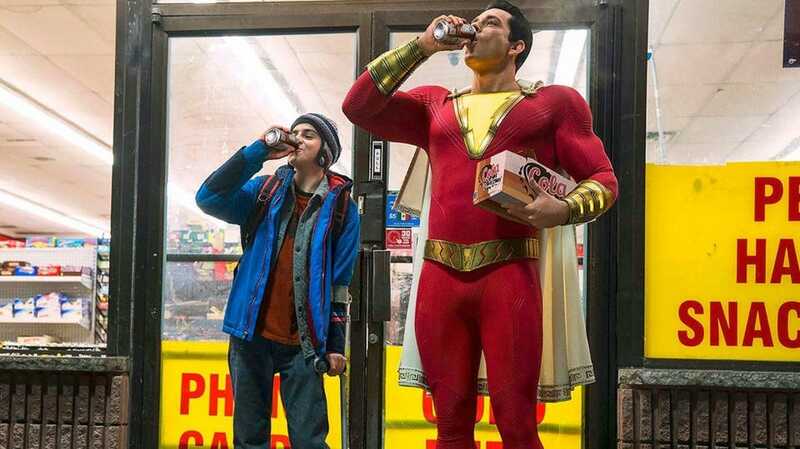 The results from the weekend box office numbers for “Shazam!” has got to give the WB and DC reason to celebrate. I was especially curious with how well the film would do going up against a reboot (“Hellboy“) and some horror films that folks may have skipped out on last weekend. “Shazam” brought in $25.1M over the weekend, bringing its domestic two week total to $94.9M. Considering the film’s budget was only $100M, we’re talking serious cash. Worldwide the film has made $221.2M in two weeks, a huge feat for a lesser know superhero. Taking second place this weekend was the comedy “Little” starring Marsai Martin (TV’s “Black-ish“) who has blown up in the past year. The film brought in $15.4M domestically, with a worldwide total of $17.3M. It’s a major win for Universal Studios, who logically did not imagine that it would 1. make that much money going up against two major action films and 2. would outright beat “Hellboy” in its opening weekend. Third place went to the Lionsgate remake of “Hellboy” starring David Harbour (“Stranger Things“) with only(!!!) $12M domestically. It has yet to be released overseas, so we’ll have to wait to gauge just how disappointing its opening is. It’s almost unfathomable how poorly the film did in its opening weekend. While the film only had a reported $50M budget, it will struggle to make that back with an opening so low. Last weeks horror remake “Pet Sematary” came in fourth at the domestic box office with a solid $10M. The production’s budget was a reported $21M, so everything from here on out is gravy money for Paramount. The film has brought in $76.8M worldwide in its two weeks. Not too shabby. Rounding out the top five at the domestic box office is Disney’s disappointing live-action remake “Dumbo“, which brought in $9.1M. That total brings its domestic total to $89.9M, which may seem like an OK number until you learn that it cost a reported $170M to make. The worldwide box office totals sit at $266M, which will sit better with Disney. However the domestic total has to give the studio pause considering their upcoming live-action remakes “The Lion King” and “Aladdin” are slated to come out in the next several months. It’s here! Gather your friends and feast your eyes upon the first trailer for the conclusion of the Star Wars “Skywalker” saga with “Star Wars: The Rise of Skywalker”. The unveiled title is clearly a device to drive conversation for the next six months regarding who the protagonist Rey’s parents were and whether or not she’s of Jedi royalty. It’s also a pretty big middle finger to “Star Wars: The Last Jedi” which made the suggestion that Rey’s parents were no one special and that she’s a nobody. At any rate, watch the trailer and post your thoughts! Disney announced quite a few jaw dropping details tonight at their Walt Disney Company Investor Day 2019 event in Chicago. If you’re interested in Disney’s upcoming streaming platform, Disney+, then we’ve got you covered. The streaming service will launch on November 12th, 2019 across all major streaming platforms, including PS4, Xbox One, Roku and many more. The service will cost you $6.99 per month or $70 annually. Further more, with Disney’s complete acquisition of FOX they are now the majority owner of Hulu and it was announced that you will be able to bundle all three (Disney+, ESPN+, & Hulu) for a discounted rate. Disney+ will feature programming from Disney, Pixar, Star Wars, Marvel, and National Geographic. It was also announced that Disney+ will be completely ad free. Bob Igor, head of Disney, announced that all of the Disney films released this year (2019) will be available on the streaming service instantly concluding their theatric run. Also announced was the live-action Disney+ exclusive television series; “The Mandalorian”, a Rogue One inspired series, “Loki” starring Tom Hiddleston, a new animated Marvel series titled “What If”, a series based off of the Avengers characters Wanda Maximoff and her love interest Vision titled, “WandaVision”. Also announced was the revelation that the entire library of Disney Channel Original television movies and series would be available day one of the streaming service. With the acquisition of FOX comes all 30 seasons of “The Simpsons” available day one. The full library of Pixar films will also be available. Warner Bros. and the DCEU collectively breathed a sigh of relief after their newest super hero film, “Shazam!”, was both a critical success as well as a box office hit. The film continues the recent success of DCEU movies following “Wonder Woman” and “Aquaman”, and while those two films were gigantic box office draws, they both had the character recognition to go with it. “Shazam!” on the other hand, doesn’t quite carry the same character recognition as the Justice League members. However, a smartly made film that focuses on the characters rather than the plot turned out to be a great move by the studio and led to the film making $54M over the weekend (coupled with the $3M it made in its one day advanced screenings two weeks ago, brings the total to $57M) domestically, while the film scored $102M internationally from 79 different markets. It’s a huge win for the WB and leads me to believe that this will allow the studio to take more chances on lesser known heroes rather than sticking to the already established ones. It’s also a huge win for the studio considering it’s production budget was only $100M. According to Box Office Mojo “Shazam!” is tracking in the same direction as 2015’s Marvel title “Ant-Man” which had the virtual same domestic opening and ended up grossing around $160M domestically in its run. In second place at the box office was the Stephen King remake “Pet Sematary” which brought in $25M domestically. The film’s budget was only $21M so everything from here on out is money in the bank for Paramount. Internationally the film made $17.3M. Disney’s live-action “Dumbo” remake placed third at the box office this weekend with $18.2M. This brings the film’s domestic total to $76M. It’s a rare struggle for a Disney tent pole film, which reportedly cost $170M to make. Internationally the film has made $137.5M for a worldwide total of $214M. The Jordan Peele horror film “Us” came in fourth with $13.8M. It was a foregone conclusion that the film would struggle going up against another horror film. The film has now totaled $152M domestically and has been printing money since it released over two weeks ago. Rounding out the top five was Marvel’s “Captain Marvel” which managed $12.6M for a domestic total of $374.1M. It crossed the $1B threshold earlier last week and is firmly in the conversation as one of Marvel’s most successful titles to date. Warner Bros. released the first trailer for the upcoming Todd Phillips Clown Prince of Crime film “Joker”. The trailer is very dark and gritty and looks to be an awards contender with an October 2019 release date. Starring Joaquin Phoenix as The Joker before we knew him, Phillips aims to show us just how this man became so manic, so vengeful, so angry at his fellow humans. The trailer does a fantastic job of conveying a film that will be representative of its subject matter. Netflix’s latest original film telling the true story of the two ex Texas Rangers hired by the federal government to track down and capture the outlaws Bonnie Parker and Clyde Barrow is longwinded and mundane. Starring Kevin Costner as Frank Hamer and Woody Harrelson as Maney Gault, the film centers around Costner as his character is pulled out of retirement by the government as Bonnie and Clyde continue to evade capture and continue to terrorize the public. It’s certainly Costner’s film as he plays the grizzled lawman who can’t turn away the offer of hunting down the nations most notorious criminals. Costner does well in this role of the aging law enforcement officer who can’t seem to let go of his past. He’s the right actor to play the part, even if the part was written to where he doesn’t get to do much with it. Costner is an excellent actor and can be charismatic when the part is right. Sadly he doesn’t get much of an opportunity to do it here. Costner is teamed up with an even better actor in Woody Harrelson, even though Harrelson is a stand-in for three fourths of the film. It’s a shame that these two actors characters were so thinly written because a Costner-Harrelson team up in a film that is well written likely would earn Oscar buzz. Harrelson’s character is a down-on-his-luck ex lawman who can’t seem to find work when the only thing he ever knew was the law. Much of the film is Harrelson being in awe of Costner and only a handful of times do we actually see evidence that Harrelson’s Maney Gault is actually a force on his own. He’s written in a way that depicts him as a bumbling doofus that can’t seem to do right. Factually, that wasn’t the case and I wonder why the decision was made to depict the character in that way. The film is over long stretching at two hours and 12 minutes. However, it’s impeccably shot with sweeping landscapes of the Midwest and the depiction of the early 1930’s. If you’re looking to kill two hours watching two excellent actors scowl at the camera, “The Highwaymen” is your cup of tea. If you’re looking for a historically accurate film with great dialogue, sadly you’ll want to look elsewhere. The film is the rare miss for director John Lee Hancock who’s credits range from “The Blind Side” and “Saving Mr. Banks”, two Oscar nominated films with excellent dialogue to go with excellent acting. Disney’s live-action remake “Dumbo” took the number one spot at this weekend’s box office, giving the studio yet another win in the live-action category. While the film claimed the top spot amongst weekend moviegoers, it underwhelmed considering the film’s expectations. “Dumbo” brought in an estimated $45M, about $5M short of where studio executives expected it to be. While it performed better than recent live-action Disney films (“Christopher Robin”, “Alice Through the Looking Glass”, and “Pete’s Dragon”) it failed in comparison to the studio’s last heavily marketed live-action remake, “Cinderella”, which managed to open to $67.9M. Experts expect “Dumbo” to gross around $145M in its domestic run, which would put it as a failure for Disney. Second at the box office was Jordan Peele’s “Us”, which dipped 53% in audience from its first week. The film still managed to pull in $33.6M, narrowly missing out on upsetting the Disney machine. Domestically the film has grossed $128M and reassures studios that Peele can print them money. Next week the horror film will square off against the Stephen King remake “Pet Semetary”. In third place Disney managed another win with “Captain Marvel” pulling in $20.5M in its fourth weekend. The comic book title has now grossed $353M domestically, with the film now totaling $990M worldwide. The film is expected to cross the $1B threshold in the next few days, becoming the seventh Marvel film to do so. Fourth place at the weekend box office belongs to the CBS Films drama “Five Feet Apart”, which has shown some serious staying power. The film pulled in $6.25M domestically, totaling 35M in its four weeks. Worldwide the film has made $50M. Rounding out the top five was the Christian drama film “Unplanned”. A film about anti-abortion. The film brought in 6.1M, which is impressive considering the film had virtually no marketing. Several television channel providers refused to show ads for the film due to the film’s message and content.